S&P 500 Index Tracking Nikkei: 40% Higher Still? Bloomberg has an interesting article that compares the Nikkei's performance since 1980 versus the S&P 500 Index performance since 1990. The chart patterns do show some uncanny similarity. If the pattern persists, the S&P would have another 40% to the upside. "Even in economies overcoming credit booms, rallies can be powerful and last much longer than you think," Bank of America’s Sadiq Currimbhoy, Arik Reiss and Jacky Tang wrote. Should the similarity between the U.S. and Japan persist, the S&P 500 will keep rising, partly because of gains in the dollar, the Hong Kong-based strategists said. Cooper Industries (CBE) is being removed from the S&P 500 Index after the close of trading on September 8th. S&P Midcap 400 constituent, Airgas (ARG), will replace Cooper. CBE becomes another of what is becoming a longer list of U.S. firms that are changing their domicile to more tax friendly foreign countries. As I noted in an earlier post in July, S&P 500 Companies Increase Foreign Sales and Foreign Taxes Paid, many multinational U.S. companies are increasingly paying higher foreign taxes due to a company generating more sales outside the U.S. With Congress wanting to institute higher taxes on U.S. firms, many are changing their domicile. The additional taxes proposed for U.S. companies is on top of the U.S. already having some of the highest tax rates compared to other countries around the world. One way in which to uncover stock investments is to run stock screens. Once resulting stocks are uncovered, one should track the performance of the screen before investing any real dollars. Additionally, conducting fundamental and detailed research on each stock is recommended before investing. The various stock screens from the American Association of Individual Investors cover a wide range of different investment strategies. Below is a stock screen that incorporates many of Warren Buffett's criteria. S&P Earnings & Dividend Quality Ranking B or better. I did include a couple of non-rated stocks in the below list. With any stock screen output, this is simply a starting point for investors. In spite of the strong market advance off of the March low, individual investors are not overly bullish. The American Association of Individual Investors reported that this week's bullish sentiment level declined to 33.98% versus last week's 34.07%. Additionally, bearish sentiment increased by 8.5 percentage points to 48.54%. The bull/bear spread came in more negative at -15% versus last week's -6%. A slew of better economic news continues to be reported. Same of the positive data is detailed below. The question becomes how much of this news is factored into the market at this time. Corporate profits are up over 11% in the first two quarters of 2009, .
Business inventories down significantly on a year over year basis. This decrease in inventory will lead to a need to replenish inventory stock. Durable goods orders were up nearly 5% in July. New home sales up nearly 10% on a month over month basis in July. Using the Dallas Fed's model, GDP growth in the second half of the year could come in at an annualized rate of 4%. Undoubtedly, the Armageddon scenario facing investors and the economy in March seems to be off the table. I believe a crucial question at this point in time is how much have the artificial influences skewed the data, i.e., cash for clunkers, one time home buyer credit, stimulus checks, etc. Will these stimulative efforts result in a sustainable economic recovery into 2010? The U.S. House of Representatives continues to investigate implementation of a tax on stock trades. I originally wrote about this in a post dated, March 1st titled, Congress Proposing Transaction Tax On Stock Trades. In July, I highlighted a screen shot from my Sitemeter account noting an additional search by the House. Well, today, the House continues to research this issue. The below screen shot notes details of the search. I am not sure how taxing stock trades is beneficial for the market. Could this be one issue that takes some of the air out of the market's recent advance? In other situations where taxes have been increased, demand tends to decline. Lower demand could mean lower stock prices. On August 31st Manitowoc Co., (MTW) will be removed from the S&P 500 Index. According to Standard & Poor's Manitowoc had a market capitalization below $900 million, ranking it 500th in the index. Replacing MTW will be Carefusion Corp. (CFNwi). CFN is a medical-technology company that is currently a wholly owned subsidiary of Cardinal Health (CAH). The company expects to become a separate publicly traded company on Sept. 1, 2009 from the planned spinoff of Cardinal Health's clinical and medical products businesses. CFN helps its customers improve patient care by focusing on two issues affecting health care: medication errors and hospital-acquired infections. The investor sentiment survey information detailed on this site comes from the American Association of Individual Investors. The AAII survey measures investor expectations about the future direction of the market, i.e., whether they are bullish, bearish, or neutral on the stock market for the next six months. The below chart shows the 8-period moving average of investor bullish sentiment along with the forward six month return for the S&P 500 Index. In February the 8-period moving average of the bullishness reading was 29% and the market has advanced 26.39% since that point in time. The current 8-period moving average for this past week equals 39.35%. The relationship between this contrary indicator and forward market returns appears to be the strongest when the sentiment readings are at extreme levels. Individual investor bullish sentiment, as reported by the American Association of Individual Investors, saw a decline of nearly 17 percentage points. The bullish sentiment level was reported at 34.07% versus last week's level of 51%. The market action on Friday and Monday that saw the S&P 500 Index decline nearly 3.3% may have spooked individual investors. This sentiment reading is a volatile one and looking at an 8-period average of the reading will smooth out some of this weekly volatility. In that regard, the 8-period moving average actually ticked higher to 39.3% versus the average last week of 38.6%. The bull/bear spread turned negative at -6% versus a positive 18% last week. Many investors are looking for higher yielding dividend paying stocks in an effort to build their equity positions while taking on less risk. Since the total return on a stock equals its price appreciation plus dividend yield, many investors believe stocks that have an above market yield are likely safer and more likely to generate market beating returns. A recent research article, Reaching for Yield Without Getting Burned, prepared by John Wightkin, CFA, Director of Equity Research Applications for Charles Schwab & Co., proposes overlaying a momentum screen on top of the yield screen. The database used in the article was the top 1,500 stocks by market capitalization over the past 20 years. This group of stocks was further divided into five groups. The initial group, Group 0, included all stocks that did not pay a dividend. The remaining stocks were divided into four equal groups with Group 1 containing the stocks with the lowest yield and Group 4 comprising the stocks with the highest yield. As the below table notes, the highest yielding stocks did not generate the highest return and just barely beat the non dividend paying group (Group 0). 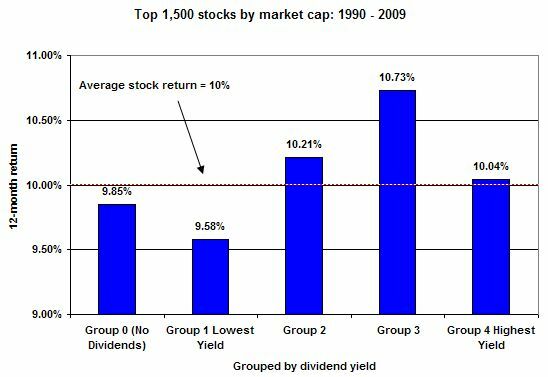 The Schwab research noted that one reason the highest yielding group lagged Groups 2 & 3 is Group 4 contained stocks that had twice as many dividend cuts as the other dividend paying groups. 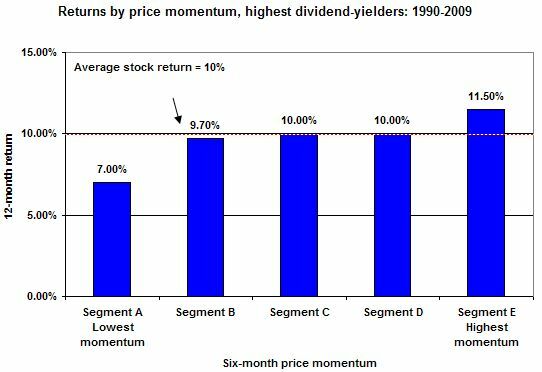 Instead of avoiding Group 4 altogether, the Schwab research determined that using a six-month price momentum screen could uncover attractive high yielding equities. The research divided Group 4 stocks into quintiles based on the stock's six-month price momentum. The stocks with the lowest price momentum were classified as Segment A and the highest momentum stocks were placed in Segment E. The stocks with the greatest price momentum, Segment E, outperformed the other segments. In looking at the fundamentals of the highest momentum stocks compared to the lowest momentum stocks, it is evident the higher momentum stocks seemed to be telegraphing a better earnings picture going forward. more net increases in analyst earnings estimates and fewer net reductions in analyst earnings estimates. In summary, screening for stocks and then evaluating how the screen performs over time is a good idea for investors. I would be curious about the survivorship bias and the adjustments that were made in prior periods. Given all the dividend cuts of late, did the company's reduced yield drop the stock into a different group. The point for investors, don't take screen results for granted. One must understand how the data is being assembled when reviewing screening results. This type of momentum screen can be run on Microsoft Money's custom screener page. Monday's market action around the globe was decidedly to the downside. For the most part though, this pullback in the markets is likely healthy. The unknown is how far down will the markets decline. The Asian markets opened mixed this Tuesday morning, but not the steep downside seen on Monday. Before Monday, the S&P 500 Index had climbed over 50% off the March low. The decline Monday occurred on fairly light volume and a little consolidation should be expected given the strength of this recent advance. At the end of March Value Line introduced its dividend focused model portfolio. Since that time there have been a number of changes in the portfolio's composition. Buckeye Partners was added this past week and replaced Capitol Federal Financial (CFFN). The current portfolio holdings are detailed below. A 13-week trial subscription to Value Line's Investment Survey is available by clicking this link. A partial list of the companies that resulted from the screen are detailed below. The full list is available in the Outlook newsletter dated August 19, 2009 ($). In this week's individual investor sentiment survey, bearish sentiment declined 2% points to 33% versus 35% last week. At the same time, bullish sentiment increased 1% to 51%. The bull/bear spread widened to 18% from 15% last week. At prior market highs, the spread has generally been over 30%. Below is an updated graph of the 8-period moving average of the bullish sentiment data compared against the S&P 500 Index. Today's down market action in the S&P 500 Index ($INX) occurred on light volume. From a pure technical perspective the market seems to be basing around the 1,005 - 1,007 area. This type of consolidation would be healthy for further advances in the S&P Index. In late July, the Financial Post noted in an article, Dow Theory Points to Start of New Cyclical Bull Market, that the theory signals a new bull market phase. If the theory proves correct and the market can hold the 1,007 level, the next resistance for the S&P 500 Index would be 1,044. There are some good comments to the Dow Theory article on Seeking Alpha. There seems to be a number of fundamental reasons why this market should not go higher (maybe this is why it will), so investors need to be disciplined in their equity purchases. One question many investors are asking is how long and how high can this market advance. Some of the sentiment indicators are suggesting investors are getting more bullish. Since investor sentiment tends to be a contrarian indicator, the more bullish they are, the closer we are likely getting towards the end of this market advance. What about magazine headlines? Newsweek: The Recession is Over? Barry Ritholtz at The Big Picture posts a positive technical chart comparing 1973-1974 to today. Comparing the 1973-74 Bear/Recovery with 2008-09. Is he becoming more bullish? In the end, it does seem logical to conclude that the easy money has been made. In this market being more selective in ones stock purchases is probably a wise approach. In this week's sentiment survey released by the American Association of Individual Investors, investor bullish sentiment increased to 50% versus the prior week's bullishness reading of 47.67%. In spite of the increased bullishness, the bull/bear spread narrowed by one percentage point to a positive 15% as a larger number of neutral investors indicated they were bearish. In the last market high in October 2007, the bullish sentiment reading reach the mid 50's level. Today, Dover Corp. (DOV) announced it was increasing its 3rd quarter dividend by 4%. The new quarterly dividend increases to 26 cents per share versus 25 cents per share in the same period last year. The estimated payout ratio on the new dividend increases to 57% based on 2009 estimated earnings per share of $1.80. The 2010 EPS estimate is $2.11 resulting in a payout ratio of 49% on this longer term earnings estimate. This compares to the 5-year historical payout ratio of 26%. The Dover Corporation stock is one of Standard & Poor's Dividend Aristocrats and carries an S&P Earnings & Dividend Quality Ranking of A-. Quite a bit is being made about the recent increase in the consumer savings rate and its impact on overall economic growth going forward. Historically, the consumer accounts for 70% of GDP. This increased savings mentality could go on for several years; thus, changing how consumers spend discretionary income dollars. Baby boomers have seen their retirement nest egg shrink, first in the bursting of the tech bubble early in this decade and secondly in the bursting of the real estate bubble. These two events alone have had a detrimental impact on investor balance sheets. Jake, at EconomPic Data, graphically details the decline in per capita real personal consumption at the same time as the savings rate has spiked. This increase in the savings rate has occurred at the same time that disposable personal income has declined. And while disposable incomes have declined, the absolute dollar amount saved has actually increased. Rebecca Wilder notes on her site, News N Economics, that this increased level of savings in a recession is an oddity. During the past six recessions leading up to this one, she notes the savings rate actually declined. The below chart shows, and Rebecca explains in more detail in her post, the oddities of this recession, the cumulative savings rate in this recession is actually increasing and now crossing the savings rate from the past six recessions. This higher level of savings maybe the new normal. The potential implications of this higher savings rate for investors is consumers may spend their discretionary dollars in other places than at the high end if the savings rate remains at a higher level than the recent past. So is it the Wal-Mart (WMT) or Family Dollar (FDO) type of stores that are the beneficiaries of future consumer dollars? In the restaurant space is it the McDonalds (MCD) of the world. In the consumer space, will companies need to have competitive price points to compete with private label store brands. Maybe the mid level retailers are the ones that get squeezed the most. Linens N Things is now just an online retailer and Gottschalks, Hartmarx, KB Toys, Eddie Bauer, Tumbleweed, Oceanaire and Circuit City have filed bankruptcy. This is not to say consumers won't spend at the high end, they just are not likely to spend on the high end like they did before this recession began. For this to develop into a longer term trend, I think the economic recovery would need to be a very weak or jobless one. If economic growth turns out to be stronger than most project, consumers have short memories and could easily go back to their spendthrift ways. For the month of July, dividend payers in the S&P 500 Index generated an average return of 9.56%. This compares to the return of the non-payers of 9.76%. The return for the payers is certainly respectable given they have been laggards this year. On a year to date basis, the non-payers return of 36.59% for and away exceeds the payers return of 6.90%. July payments were down 31%, marking the lowest July payment since 2002. Companies have been cautious, with the average increase down to 8.5%. This is compared to an average increase of 13.7% in 2008 and 18.2% in 2007. Year-to-date, there has been 71 dividend cuts (61 reductions totaling US$-46.1B and 10 suspensions costing US$-1.2B). The Q2 2009 reductions in payments of 23.4% is the worst since the 24.4% decline in Q3 1958. Given the strong market advance off of the March 9th lows, it would seem the easy money via indexing has been made. At this point in the cycle it would appear investors should be a little more selective in their stock purchases. Over 85% of the stocks in the S&P 500 Index are trading above their 50-day and 200-day moving averages. Many analyst, for varying reasons, believe the market is due for some type of pull back (maybe a reason it won't occur). If this pull back scenario materializes, investors will want to be in stocks that may be more insulated from a decline. Stocks that might fit this category are ones that have not participated in the rally or at least have lagged the market. payout ratio less than 50% based on trailing 12-month earnings. 1-year and 5-year dividend growth rate greater than 5%. year to date total return below -10%. This is simply a list investors can use as a starting point for further analysis. Some of the stocks in the above list have had strong returns since March, but simply lag the market. Additionally, a few of the stocks on the list are trading above their 200-day moving average. Below is an update of Better Investing most active purchases over the 4-week period ending August 1, 2009. The recent buy and sell decisions represent 119 transactions over this period. As S&P notes, and I certainly concur, this is not a buy list. It is a useful starting point for potential dividend growers though. The list has changed from the one detailed in my post on June 30, 2009.